A&D FX120i labscale reloading upgrade with V2 auto trickler review. Hey guys. Just an FYI if you haven't seen them, but I started making reducing inserts similar to what I've been making for the CM for years to reduce overthrows. Hit me up if you'd like try a set. I'll send a free set out to Aimsmall55 to try. A picture of your product would be great. How about a video working in conjunction with Auto-Trickler? Ordered the set-up last week, got the Area 419 aluminum base and PVA powder cup. You said more folks find the larger inner diameter insert works best for extruded H4350/ varget type powders? Or do I have that backward? Now that I've got more feedback on that, I get conflicting reports. Some like the large and some like the small for the extruded stuff. I guess it just depends on how you have yours set up. Lots of guys are using the 419 base with varying degrees of tilt. You get both diameters in the set, so you can try them both out and see what works best for your setup. Yes sir- I have your inserts on the CM - and now that I got the FX 120i w/ its resolution- I love to show folks how accurate and consistent them CMs can be with the reducing sleeve. Still messing w/ the autotrickler- and will try the smaller set tonight. I was having a slight degree of clumping on the large insert last night maybe on average every 10th throw, but like was mentioned we are getting in the weeds bitching over 1 kernel of powder. Yeah, its just a matter of a little experimenting, but with the inserts and proper amount of cant in the base, it should be money almost every time. I'll be interested to see what you come up with on the CM testing. I had a buddy run that test last year on a high end scale and he came up with a charge weight avg within 3 kernels or so if I remember right. I made one that, I think, has a smaller ID than the ones MDM is making. I'm running R26 through it at the same speeds as no insert and it works. There's no way I could run N570 through the ID but it works great with the smaller extruded powders. Well here's 28 shots for a seating depth test with your same variations with an SD of 5.3...once I picked my optimal seating depth and shot another 30rds SD dropped to 4.4...all with the same variations your seeing..
That is very informative data. Thank you for sharing it. Well I ordered the full kit this morning. Plus the 419 base and the new powder cup they are making. Spending this much on a scale is nuts but hey you only live once. That’s the same setup I have and yes, it’s absolutely worth it to me just for the decrease in time spent loading. Like you said, you only live once, and the less time I can spend in front of a press and the more time I can spend shooting makes the cost easier to swallow. Just a word of caution before jumping in all the way, and starting your reloading with the FX or any high end balance. I've been using high end by reloading standards, be it a Sartorius GD503 Balance and sense they were available, the newer FX120's. I am now on my 3.. yikes. They don't like to be dropped or have someone stack something on them.. Repairs seem to cost as much as a new scale. So If you can leave it in one spot with the protective cover on. Run it far enough back that someone can't walk by with a load of groceries etc.. and blow it off your bench.. Once was bad, twice was really bad! Damn, you discontinuing these or is a new version coming? Does this work or on just the scale portion if I bought the complete kit on Saturday? Yall havent even shipped it yet. Wow, that’s a smoking deal. What if I bought mine three weeks ago? Well, that pushed me off the fence. Just ordered one. I've had my FX300 for a few years. At the time I bought it, the cost was around $25 more than the 120 with the same resolution/precision plus a 320 gram capacity. You never know when you might have to reload a howitzer, after all. I recently bought the Autotrickler, then added the dumper 6 weeks later. I never even tried to use the plastic cups that come with dumper, I just used an aluminum pan I already had. To prevent dumped kernels from bouncing out of the pan, I put a dogleg bend in the end of the tube (drinking straw) which does a great job of decelerating the powder right before it hits the weighing pan. Also, I started weighing my charges in grams rather than grains. The balance has 1 milligram resolution so it makes more sense to me to do the math beforehand for potentially a little higher accuracy. With this combination, roughly 90% of my charges are -0/+1 milligram of the target, and it doles them out much faster than I could do it manually with no fuss. For me it was a no brainer, being as I already had the balance. A friend was so impressed he went out and bought the kit, FX120 and all. At the time I bought my AnD, the best price I found on the FX120 was around $620 and it's an even better deal at $500. A few years back, a SH member found someone selling the FX120 for closer to $400. IIRC around a half dozen or more members took advantage of that deal. Good catch, that one. *edit* I went out to take a picture of my setup and I misspoke (mistyped?) above. I used the plastic cup provided with the thrower plus a dogleg bend in the straw. Still no kernels bouncing out of the pan, though. I received the Kern'l Dump'r the other day. I made a Delrin 'tray' on my lathe that fits the base of the Dump'r perfectly so it goes in the same place each time. I like the heft and the handle is the perfect length. The plastic cups that come with the auto dump are just too clumsy. Looks like A&D only needs the complete invoice and no barcodes? Had one of Adam's tricklers for quite a while now. Before he started offering his own bulk thrower, I built my own servo controlled automatic bulk dispenser from a Harrell's powder measure and worked with Adam to integrate my automatic measure and arduino controller with his trickler controller. Later, he started offering his own bulk thrower using the cheaper Lee measure to get a product out with a more reasonable price point than what I built. Regarding measuring cups, I currently use stainless 3oz camping shot glasses from amazon... high enough to prevent powder splashes, easy to weight match via sanding (things go fast if you use 2 weight matched cups in rotation), but they may be too tall for how Adam uses the stock draft shield with his bulk thrower. I like PVA's undercut perimeter and center spike arrangement to deflect kernels into the undercut perimeter and prevent splashes. The Area 419 cup looks good too. Don't have much of a problem with splashes on my setup as the stainless glass is about 2" tall plus I can easily vary the speed that my Harrell's automatic powder measure dumps the bulk charge to prevent splash. Regarding occasional overcharges... trickler finishing speed and trickler angle do play into it, but what I noticed is that many overthrows were caused by "bunching" of the powder kernels in the trickler tube and it dropping several kernels at once near the end of the ramp down leading to an overshoot of the target weight. What I did to minimize this was to attach a piece of stiff wire to trickler, ran it above the trickler spout, and at the end bent it into a "U" and had the short leg of the "U" protrude into the trickler spout about 1/2". I bent the wire until so it's sitting slightly off the bottom (6 o'clock) position of the inside of the trickler tube. What the wire does is it hits and "breaks up" any multi-kernel piles in the trickler tube and knocks them down to single kernels riding in the grooves of the spout so it can more reliably dispense those last couple of kernels, 1 kernel at a time. Adding the wire to break up any bunched/clumped kernels significantly cut down the amount of overthrows and also made the trickler less sensitive to tilt and finishing speed. Can you post a pic for us? thanks! Here it is... quite simple. Any wire should do the trick. I tested it first by zip-tying the wire to the housing to make sure it worked, and when I was happy with the results I drilled and tapped the trickler body. The wire pokes into the end of the trickler tube about 1/2" and almost touches the bottom of the tube at the 6 o'clock position to break up any clumps. How long did it take you to receive it? I ordered mine a week ago. Well mine shipped today. Hopefully I'll get to try it out at the end of next week. Got mine yesterday, ordered on 2/13. I ordered mine from DWS, which costs much more than what most folks are quoting here. but i checked with other retailers and DWS seems to have better customer returns/exchanges (free shipping label as long as issues is not my fault) and the sales engineer mentioned they are more willing to work the customer. The other retailer just said they'd take a look but shipping was on me. Cambridge Environmental is selling the A&D FX-120i for $500 US and there is a 30% off rebate from A&D until the end of March. Curious if anyone got a 3D printer who can print a taller A&D wind box pillar? and print the wind deflectors too? Or anyone sell them? Area419 announced they had something the works but no specifics yet. I hope they make an entirely new box that is taller out of Aluminum as the top is flimsy with the Auto Thrower attached and hard to see down in there where to place the cup. Have to bend over constantly. Some info for you all, since the scale doesn't come with a calibration weight you'll need to buy one (either 50gram or 100gram). I wanted a higher quality check weight so I bought a Troemner ASTM Class 1 50g weight off Ebay for a pretty reasonable price. It was surplus from a lab and came with serial number and hard case, They normally go for close to $100 but I was able to grab this one for $30. ASTM Class 1 is better than the cheap $5 calibration weights you can buy. ASTM 1 is rated to be 50 grams plus or minus 0.00012g (or to put in another measurement, plus or minus the weight of 2.5 fingerprints). The cheap ones are OIML M2 rating which would be 50g plus or minus 0.01g. I got the Troemner weight in the mail today and was able to calibrate my FX120i for the first time. FWIW, the calibration weight registered at 50.036 grams on the scale as it was set from the factory, so a bit high. Initially I had tested the FX120i using my home made check weights and noticed a difference from my prior scale by about 0.06 grains for charge weights in the 60 grain range. However, once I calibrated the FX120i it then matched perfectly with my prior check weights. It was interesting to see that the prior results I had with my GemPro250 and the little cheap 20 gram calibration weight that came with it were pretty much spot on. The GemPro250 20 gram weight registers as 20.001 grams on the calibrated FX120i, pretty close. For weights in the realm of typical powder charges (25-60 grains) they match exactly. Very handy for me, since I can keep using all my prior load data exactly the same going forward with the new scale. Hopefully this is helpful info for you all who are transitioning from the GemPro and want to make sure load data is transferrable. No comments yet on loading with the FX120i, other than to note that it hasn't drifted and has been given consistent weight measurements over several days. Hope to load with it here soon for the ELR match, now that I've got it calibrated. My expecation is not necessarily that the powder charges will be more accurate, just that I won't have to fight the scale drifting anymore. I've always had to watch the GemPro closely and rezero often. Curious, do you guys use the scale with the plastic cover or have ya'll removed it? Not the top windscreen, but the whole balance plastic cover. I pulled mine off, a bit cumbersome and reflected too much light making the display hard to see. Plastic cover that isn’t the windscreen? Mine has the four clear panels of which I didn’t install the front and a side for the trickler. Then the top that the thrower sits in. What am I missing that y’all have? I purchased an ASTM class 2 weight for mine. Saved some money since I couldn’t find a used one like you did. The scale can’t resolve the difference between a class 1 and class 2 weight anyways. The plastic cover over the whole body of the scale that was in the shipping box. I don't think it's meant to be left on, though I did momentarily consider it as a dust cover. Got mine in and put it together yesterday. Really glad I ordered the 419 year to go with it. Thanks for the info. I ordered one! How important is the ASTM classification for these check weights? Up until this point I havent bothered with checking it and I have zero complaints so maybe ignorance is bliss in my case. 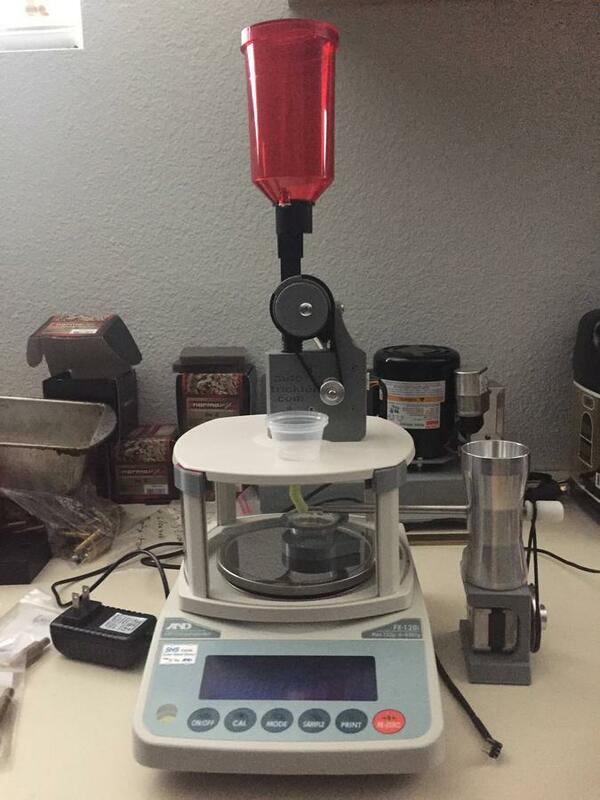 "ANSI/ASTM Class 1 - Can be used as a reference standard in calibrating other weights and is appropriate for calibrating high-precision analytical balances with a readability as low as 0.1 mg to 0.01 mg."
So based on the .001g (1 mg) resolution of the scale this is is appropriate if following the rule of thumb that something needs 10x the resolution of the thing its checking to be valid. "ANSI/ASTM Class 7 - For rough weighing operations in physical and chemical laboratories, such as force measuring apparatus." So is it really necessary to ensure that scientific validity of the operation with a $100 check weight or would a $20 class 6 or 7 weight be sufficient for what we are doing? I just grabbed a ASTM Class 1 Rice Lake 50g check weight in box with cert off ebay for $47. I wouldn't pay $100 but under $50 I'm good with.